These are fascinating and hauntingly beautiful works by two Canadian composers and one American. Keith Jarrett is the best known of the three, and his ELEGY FOR VIOLIN AND STRING ORCHESTRA is a lovely memorial piece in a style far from the jazz that we normally associate with him. Marjan Mozetich, born in Gorizia, but raised in Canada has written a deceptively “old fashioned” piece with many surprising harmonic twists and turns in FANTASIA… SUL LINGUAGGIO PERDUTO. His early compositions that I heard in Toronto were definitely atonal. He seems to have mellowed with age, but somehow has not lost his “edge”. Roddy Ellias has also written a memorial type piece in WHALE SPIRIT RISING. This is a concertante work for Baritone Saxophone and string orchestra. It channels whale sounds and Micmac Indian themes and legends. It is the longest piece on the disc and both haunts and moves. Eleonora Turovsky (Violin) and David Mott (Saxophone) are the absolutely brilliant soloists. Yuli Turovsky and his I Musici de Montreal are arguably the best string ensemble in North America. 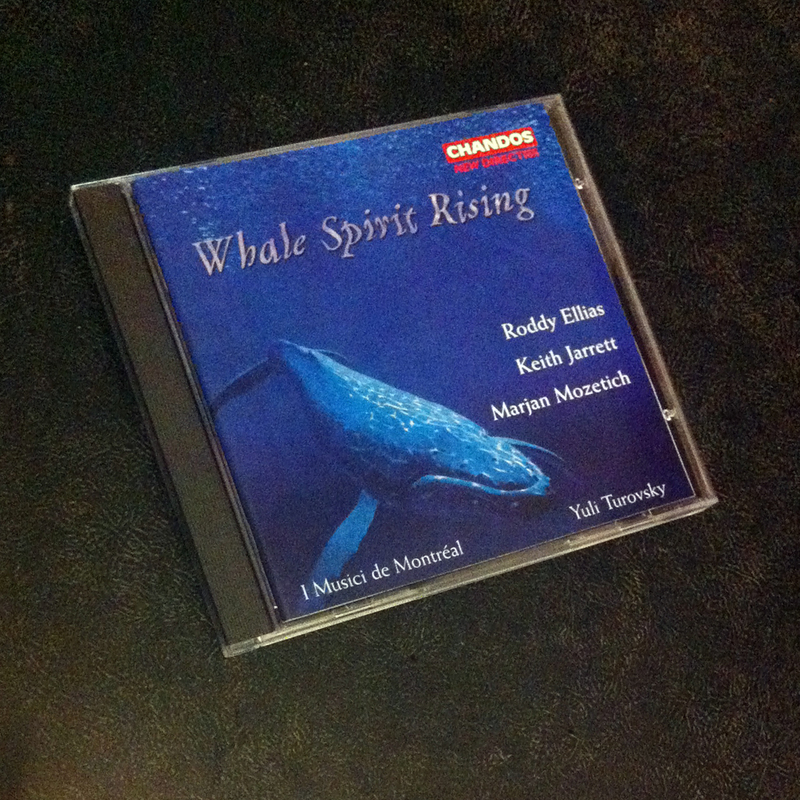 WHALE SPIRIT RISING is a collection of three pieces that are elegies in sentiment. They are performed by I Musici de Montréal and conducted by Yuli Turovsky. The title track, ‘Whale Spirit Rising’, by Roddy Elias, features the baritone sax representing the voice of the whale-spirit. The solo voice laments over a low, gently rolling string ostinato, becoming more elaborate as time goes on. Only a small portion of the solo part, played by jazz musician David Mott, is actually composed, with the rest being free improvisation flavored with whale-song. Italian-born Marjan Mozetich’s ‘Fantasia… sul linguaggio perduto’–literally ‘Fantasia on a lost language’–is a sort of elegy to the sounds of the late Romantic Era. Mozetich’s new-romantic lyricism has a contemporary flavor in its energetic repeating rhythms, but the colors of the lush string writing harken back to an earlier sound-world, reminiscent of Tchaikovsky. Keith Jarrett, of jazz fame, whose works for the concert platform are often overlooked, wrote Elegy for Violin and String Orchestra for his grandmother. This is harmonically more adventurous than the other pieces, but the violin solo, played by Eleonora Turovsky (wife of the conductor), would fit in with a work by Samuel Barber. Length: 18 Minutes 28 Secs. You are currently reading Whale Spirit Rising at IvyU.